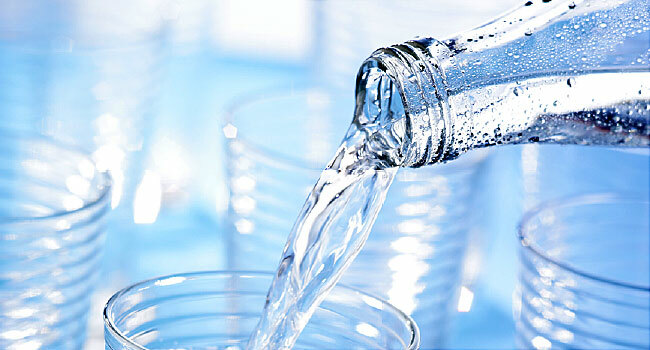 Home health What Quantity of Water Should You Drink Per Day? What Quantity of Water Should You Drink Per Day? According to most estimates, the human body is made up of at least 60% water. Given the fact that so much of our bodies consist of water, it’s essential that we maintain a good hydration level. This is achieved by consuming the required amount of water in order to replace the fluids we lose during the day through sweat, human waste, and respiration or breathing. But, how much water do we need to drink in order to maintain proper hydration? Research has shown that the ideal water intake for a healthy adult male is 3.7 L per day, and slightly lower for women at around 2.7 L per day. Men typically require more water than women due to the simple fact that they usually have a greater amount of lean tissue, thereby expending more energy on a daily basis. external environmental factors such as temperature and humidity. Perhaps, the most prevalent factor that affects water requirements is hot and humid weather, which is something you should pay particular attention to during the summer months. The summer season has increased temperatures, which can dehydrate you quicker if you are working or being physically active outdoors during the summer heat. With increased sweat, due to higher temps, comes increased chances of dehydration and an increased need for proper water consumption. A great deal of research has been conducted in this area, including observations of forest workers using manual labor methods in the temperature conditions of Zimbabwe. Findings suggested that individuals engaging in heavy physical activity of this kind can require at least 5 L of water per day. So, if you are working in hot, humid conditions then it’s best that you add at least another liter of water per day to the baseline recommendation. A similar water intake approach also applies to those of you who are very physically active in an athletic capacity, particularly if you engage in high intensity workouts. Sweating can result in the loss of electrolytes and as much as 3 – 4 L of fluids per hour depending on some of the other factors we discussed like age and physical conditioning. The WHO recommends that athletes rehydrate themselves with 1 L of water per 1kg lost from their athletic training or competition. Items like LYTEshow, are designed to rapidly replenish electrolytes and they do so without adding extra calories, carbs, sweeteners, or artificial preservatives to the liquid drink. For example, if you consume 300 calories more per day during your pregnancy, then you should consume 300 ml of water more per day. For those who are lactating, the EFSA recommends consuming another 600 to 700 ml per day in order to compensate for loss of fluids. Furthermore, if you are overweight or obese then your water requirements will typically be higher than the average individual because of the larger surface area of your body. On this basis it is recommended that you consume 30 – 40 ml per kg of bodyweight to stay adequately hydrated. This places a 300 lbs individual’s water requirements at approximately 4.8 L per day. It was speculated that obese people didn’t consume enough water, instead they consumed more unhealthy calories. The second study, which was published in Obesity, found that obese/overweight individuals lost more weight drinking water prior to meals than those who didn’t. These subjects were required to drink 16 ounces of water 30 minutes prior to their meals. Over a 12 week period, they ended up losing 9 pounds because of this practice, and they lost 3 more pounds than those who didn’t drink water prior to their meals. So, not only does a higher body weight and BMI require more water to stay adequately hydrated, but proper hydration is also believed to prevent obesity and lead to weight loss. When you are sick, particularly with a stomach bug or diarrhea, you run the risk of dehydration due to not being able to keep anything down or constantly expelling fluids. So, that means you will probably fall well below the baseline recommendation of water intake per day. Ideally, you will want to start consuming liquids as soon as possible. However, that’s not always the cases especially when you are still in the extreme vomiting stages. If possible, doctors recommend that you try to consume 2-4 ounces of fluids every 2-4 hours. This may mean you have to water down Gatorade in order to get some much needed electrolytes as well.